When I go out to shoot a motion portrait, cinemagraph (click here to see my article Ultimate Cinemagraph Creation) or a performance video, I try to travel pretty light. 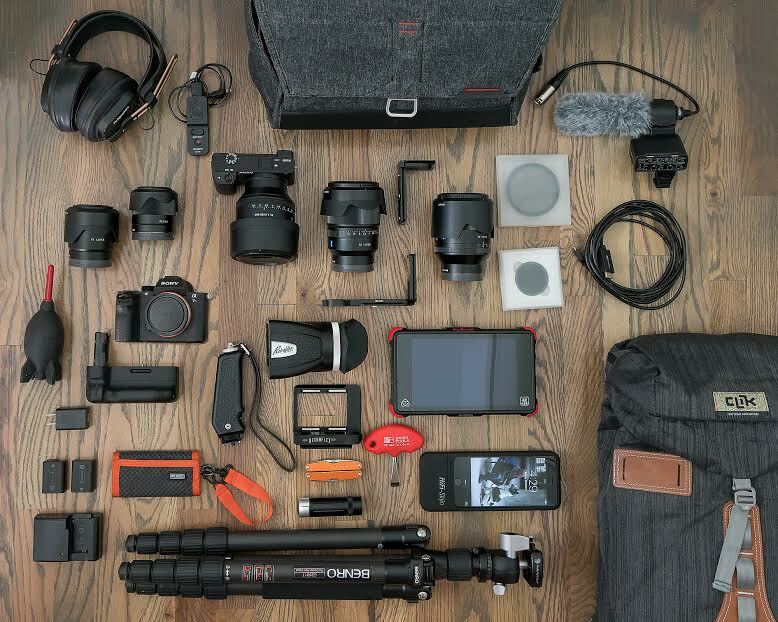 Each job is different and the kit might change up a bit but this is a good representation of what I usually pack for small intimate shoots. Cameras: I always carry at least two camera bodies. 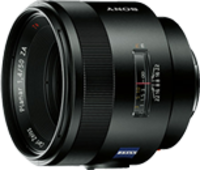 My current preference is to use the Sony α6300 as my main video camera backed up by the Sony α7R II. Both of these cameras shoot beautiful 4K video in Super35 mode. 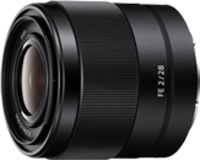 These three lenses are superb and with the Super35 crop factor magnification, they provide a focal length range roughly equivalent to 52mm - 127mm, which is perfect for portraits. Retroflex: If I want to shoot hand held video, the α7R II gets rigged up with the Retroflex from Redrock Micro. This converts the α7R II into an ergonomic hand held video camera reminiscent of a super 8 movie camera. I used to bring a large pelican case with a Redrock Micro shoulder rig but the Retroflex combined with the internal optical stabilization of the α7R II makes it unnecessary to lug all that heavy gear around for every shoot. When shooting hand held with the Retroflex, I tend to use the smaller and lighter lenses like the amazing 55mm f/1.8 ZA and the 28mm f/2.0 FE which is also excellent and often underrated. Battery Grip: Even if I’m shooting mostly video, I’ll often want to get a few still photos as well so I bring the Sony Vertical battery grip for the α7R II, loaded with two batteries. ND Filters: I also bring ND filters and step down rings (not shown) for all the lenses in my bag. HDMI Cable: I always carry a micro HDMI to HDMI cable so that I can play video and show stills directly on a flat screen television. Tripod and Ballhead: A necessity for shooting hybrid video is a good tripod. My lightweight tripod is a carbon fiber Benro Travel Angel with a Really Right Stuff BH-30 ballhead. Most of the video I shoot is locked off so I don’t need a fluid head or video specific set up. When I do, I bring along a larger Benro Series 2 tripod with an S4 video head. L-Brackets: I have Arca Swiss style L-brackets for the α6300 and the α7R II. Unfortunately, I was impatient and bought cheap ones from Amazon instead of waiting on Really Right Stuff brackets to ship. I regret this decision and would not recommend the brackets in this photo. I’ll be replacing them shortly with Really Right Stuff or a more universal design from Aracatech. External Recorder: A new addition to my kit is the Atomos Ninja Flame external recorder. With this recorder, you can capture uncompressed video from the camera’s HDMI port. It’s also really helpful if you are shooting in one of the flat SLog profiles because the Ninja Flame will adjust the screen to show a more dynamic image closer to what you would get after color grading in post. This unit also provides a headphone out port for monitoring audio which is a big help when using the α6300. Sometimes I put it and a few of it’s accessories in a soft case for one of my other camera bags but it has it’s own pelican case which is not pictured. Headphones: I am a bit of a headphone fanatic. I am a long time member of Head-fi.org and I actually go to headphone meet ups. I have several pairs of closed headphones for monitoring audio when recording. I also carry a lot of music with me on my 128GB iPhone 6+ in a case with an extended battery, DAC and amplifier. Often during other downtime on set, you will often catch me listening to headphones. The headphones in this photo are Mad Dogs, which are modified Fostex TR-50’s. Microphones: Even if there is no dialog in a lot of the video I shoot, I like to record ambient sounds for the final clips. To do this, I bring the Sony XLR-K2M or the smaller Sony ECM-XYST1M Stereo Microphone. The shotgun mic works really well for voices and to point at gurgling streams or birds in trees where the stereo mic is better for loud music and overall ambience. Remote: Another important piece of gear for video capture is the Sony RM-VPR1 Remote Control with Multi-terminal Cable. This wired remote makes stopping and starting video a breeze and minimizes camera shake from pushing the video record button on the camera. Memory Cards: Of course I bring plenty of fast Sony card media held safely in a ThinkTank card wallet. I also bring at least 4 batteries to every shoot along with a charger and the camera charger. Cleaners & Tools: A Giottos Rocket Blaster to blow dust off of the sensor and lenses is a must have in any photographers kit. Other tools I always have with me are my Juiceman multi-tool, a Swiss Tools tripod mount screwdriver and an LED flashlight. There are also a lot of odds and ends including extra cables, allen wrenches, clamps and other small grip gear that are not pictured because they would clutter up the image. Shoulder Bag: The bags carrying all this gear change depending on each shoot. I start off by putting both cameras and my primary lenses in my Peak Design Everyday Messenger bag. Then I have various smaller bags and cases for the rest of the gear that travel in my Clik photo backpack, a Crumpler rolling bag or a Pelican case.